New Zealand’s tax take puts it roughly in the middle of tax rates in developed countries. Tariffs began when British sovereignty was proclaimed in 1840. The government spends a large share of its tax revenue on health, education and social security. In the early 2000s taxes were around 39% of the country’s gross domestic product. Taxation began in New Zealand when British sovereignty was declared in 1840. The first taxes were tariffs on imports such as alcohol and tobacco. There were other indirect taxes on legal documents like mortgages, and people paid death duties (taxes on inheritances). Local governments also collected taxes – known as ‘rates’ – and by 1874 rates payments were about 7% of all taxes. Governments borrowed money to fund the country’s development, and in 1878 charged new land taxes to repay the loans. There was debate about the ‘unearned increment’ – people thought that landowners who did nothing to develop land should pay a tax if their land increased in value because of other people investing in their area. In the late 19th century people’s income was directly taxed, but only if they earned more than £300 (around $50,000 in 2008 terms). 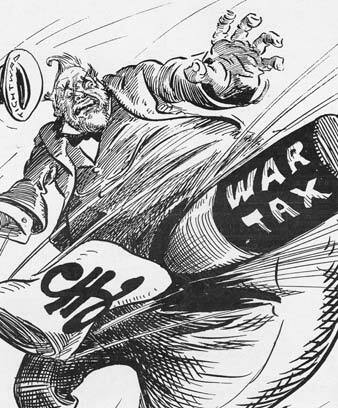 In both world wars taxes were raised to pay for soldiers to go and fight. Politicians felt it was fair if people were taxed at higher rates the more they earned. Flat taxes meant poor people paid the same rate as rich people and found it much harder to afford. In the Second World War high-earning people paid as much as 90% of part of their earnings in income tax. During the 1930s depression the government taxed all working men to raise money to help the unemployed. This ‘poll’ tax continued after the depression. From 1958 tax was taken straight out of people’s pay – called pay as you earn or PAYE. Some people claimed it would be easier for politicians to take money from people because they wouldn’t see it before it went in tax. Over decades governments changed tax rates to pay for social spending like education and health, or to woo voters. As a way of encouraging investment in industry and farming, governments offered tax breaks. But some people used these incentives as tax ‘loopholes’ to pay even less tax. The tax system had become complicated, and tax incentives were seen to be distorting the economy. People didn’t really know if businesses like farms were highly profitable or not. In the 1980s a Labour government made major changes to taxes. They standardised indirect tax and introduced an across-the-board tax on goods and services – GST. Tax incentives were removed and personal income tax rates were simplified. There were just two personal income tax rates: 24% on income up to $30,000 a year, and 33% above that. In the 2000s New Zealand taxes were about 39% of the total value of goods and services produced each year (the gross domestic product, or GDP). This put New Zealand roughly in the middle of tax levels for the OECD (a group of 30 modern economies). The tax system is quite simple compared to other countries.